I love this time of year. Not just because the weather warms up significantly. Our summer doesn't normally start before July 4th, but it has been unusually warm for the past month. Maybe Mother Nature decided to give us a break after the cold, snowy winter (another unusual phenomenon). I'm totally not complaining. I finally did manage to throw together some berry crumbles (for the first time) and all I can say is WOW! I've never been a big fan of crumbles because they are usually served with a pile of fruit and just a sprinkling of topping. I like there to be a good amount of crusty topping in every bite. Making the dessert in ramekins works perfect to give the right amount of topping to fruit. Plus they look super cute, don't they? Making a crumble is so easy, easier than making a pie because there aren't any crusts to roll out. For the topping, I used Ina Garten's recipe. For the filling, I used my berry pie filling, but any pie filling would work. Begin by making the topping. In a food processor, pulse the flour, sugar, brown sugar, salt and butter until you get a coarse mixture. I like to add the oats and pulse a couple of times to break them up a little. Transfer the mixture to a large bowl and add the almonds. Mix in the almonds making clumps (although it will still be pretty loose). In another large bowl, combine the granulated sugar and cornstarch and mix until all the cornstarch is mixed in with the sugar. Add the fruit and lemon juice and carefully mix, trying not to mash the fruit. Transfer the fruit into a large baking dish (or ramekins) and press the topping on. I like to make sure the fruit is completely covered. Bake in a 350F oven (on a sheet pan to catch the juices) until bubbly and the topping is golden. Serve warm, with a scoop of ice cream. Here's a tip: if you use ramekins, the dessert can be wrapped and easily reheated. They'll keep in the fridge, well wrapped, for about a week. I bake the crumbles until they are just golden and then reheat them under a broiler to crisp them up and warm the filling. those look beautiful D....I love crumbles served in individual servings too. It always feels more special than one cut out of a big pan. Just so happens I'm having friends over for dinner tonight, too, so very nice timing....thanks for sharing the inspiration! Manggy, I haven't tried freezing them yet, but that would be so convenient. And even though you don't have access to an assortment of berries, you can more readily find durian! Or jackfruit! Orlychees! Or really juicy sweet pineapple! bb, I've probably noticed I have a soft spot for mini-sized desserts. Makes it easy to figure how big a serving is. And they are just so darn cute. oo yes, I can finally move on from apples and oranges to berries! I love the idea of making them in their own little ramekins. I also almost prefer the topping to the berries, so being able to make sure it's all proportioned just right is great! Yeah, who needs pie crusts?! =D I admit, I do like these crumbles to be quite generous with the topping too... the fruits are just the vehicle for crumble topping. Oooh... melting vanilla ice cream... looks scrumptious. Ina Garten recipes are great and even though I've never made this, I know it will be good. Look at the thick and syrupy berry juices dripping down the side of the ramekin. 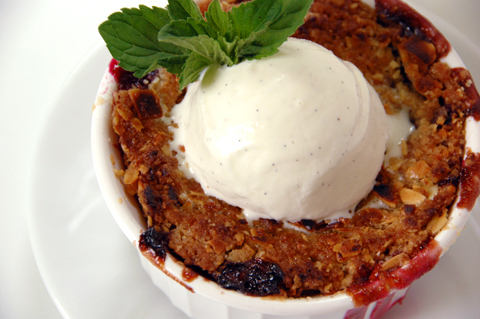 (Swoon ...) The warm crumble and the cold ice cream are so perfect together. hey d...made this last night for dessert and everyone LOVED it. Plus it was so easy...thanks again!! Crumbles are such a quick and easy dessert to put together in a hurry (provided you have the ingredients). The crumble topping is also something that freezes well so you can mix a large batch and have it ready to go. Yours look delicious. pigpig, I prefer berry crumbles and pies to apple. I'm sure you guys get a bunch of berries over there in the UK. ts, making a crust is not too hard, but this is still easier and hubby prefers the crumble topping. Leela, Ina Garten's recipes are always good, and this crumble topping is really, really good. Just sweet enough with enough texture. Her vanilla creme brulee is also to die for. That's the base recipe I do for all my creme brulee variations. sijeleng, good to know that the topping can be frozen because I have extra. I've just been keeping it in the fridge, but I'm going to throw it into the freezer. Thanks! bb, good, huh? We're addicted. I just made another batch with strawberries and rhubarb. These look really good. I'll bet they taste as good as they look. It's always nice to have a recipe like this when berries start streaming in from the fields. I'm making this asap, I almost gasped out loud when I saw the picture it looks so good! I also love that you made it in ramekins, it's so much better to have your own dessert! I can't tell you how many times I've stolen / adapted this! Okay, four times. And for a non-dessert maker? That's epic. dds, it is so good, isn't it?! Thanks to Ina Gartner! Her recipes always work well and are easily adpated. This has become Hubby's favorite dessert.